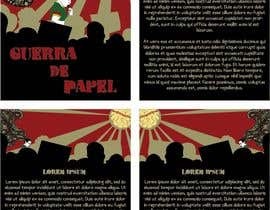 This is a project for design the graphics visual identity of a Brazilian feature film called Guerra de Papel (Paper War). It's about poor black (and descendants) young students of Brazilian public schools system looking for respect, better educational conditions (structure, teachers, system itself), fighting against exploitation of the people and social inequality. The color palette can be inspired in Rastafari colors red, green and yellow which is a good representation of the student movement presented in the movie. We need a digital booklet graphic design (cover and two pages designs) to be used to present the project for fund raising and also digital presence: website, Facebook and Instagram (cover, profile image, background images). Thank you so much for your interest in our project. Unfortunately the contest period has ended. We are now working in the short list, which has two designers selected within 8 designs submitted. Any change in this scenario we will let you know. This project is very important for our group. We are a Brazilian film producer experienced in production of movie festivals, short films, feature films and TV series. It is a low budget feature film project, awarded in ANCINE (Brazilian National Cinema Agency) in the public call "Low Budget Affirmative Feature film" *. The winner of this design contest will have the chance to works with us in this project, which is only at its beginning and any other creative designs for poster, publicity material and any other graphic art has a huge chance of being requested to also work on it. Additionally, any other project developed by us is potentially a new demand to be directed to the chosen designer. * "The Low Budget Adffirmative Feature Film" public call has as its object the realization of three unpublished films of fiction, with free themes, directed by black filmmakers. Já tenho aqui uma pequena base concluída, interessado em ver? Fique a vontade para submeter a sua sugestão de design. Comprometo-me a avaliar com carinho e dar o devido retorno com a opinião de nosso grupo. Sendo positivo o retorno, certamente iremos contratá-lo. Esse projeto é muito importante para o nosso grupo, que é uma produtora de filmes brasileira, com alguma experiência na bagagem. Infelizmente o projeto é de baixo orçamento, portanto os recursos são limitados. De qualquer maneira, o vencedor desse primeiro desafio terá a chance de desenvolver outros trabalhos conosco, uma vez que o projeto está apenas no início e qualquer outra necessidade de criação para cartaz, material de divulgação e qualquer outra arte gráfica tem enormes chances de ser solicitada para o vencedor. Hello A S. Thank you so much for interest and for your message. As far as I'm new in Freelancer.com, I'm not familiar with the designers and its works. For sure we'll choose the best design which matches our expectations according to the briefing posted in the project description. If you feel confident about your potential, please submit it for us. if you need more information that allows you to capture the essence of what we've been looking for, feel free to ask us. It'll be a pleasure to reply to you . But at this moment I don't want to set it as guaranteed once I don't have any warranty about the results we could (or could not) achieve. Again, we're here to help you and hope we could work together. Please check my entry. Entry #3. Thank you. Hi, what do you want to see on graphics? Anything in particular. You need to narrow down. Hello Assiya, thank you for your comment. We are looking for a design to be used in a fund raising material including a brochure with details of the project (contents related to the feature film concept, references, budget, schedule, creative team and some info about the producers background); a website and social network profiles. That said, we need a graphic design which represents the mood of the movie and at the same time must positively impress potencial investors to get empathy with the theme and encourage them to put money on it. Don't know if I've answered your question. But please let me know if you need any further information.